Discussion in 'News' started by Ree, Jun 13, 2018. Mike Shinoda is set to perform on NBC's “Tonight Show Starring Jimmy Fallon” on Tuesday, June 19. Filming for the show takes place in New York City. 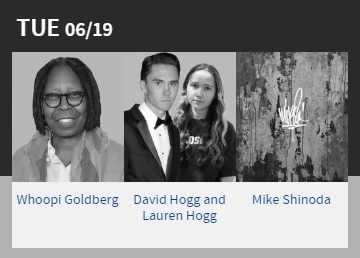 Other guests listed to appear on this show include Whoopi Goldberg & David Hogg and Lauren Hogg. Following the release of his new album 'Post Traumatic' on June 15, Mike will be at Looney Tunes Records in West Babylon, New York on June 18 for an in-store signing. Mike will also perform an album release show on June 20 at the Gramercy Theatre in NYC. Pre-Order Post Traumatic on www.mikeshinoda.com. Are you attending any NYC events? Let us know in our forums! Hybrid, Ksandory and Joe like this. Awesome! And yes, I will be both at the signing on Mon, the 18th and the CD release show in NYC on Wed, the 20th. Here's hoping he gets The Roots to do the instrumentation for this performance. It wouldn't be the first time they've worked together or played live, and it'd be cool to hear some of the PT songs with The Roots going nuts on it. First time Mike and Black Thought have been together in a while.